The Saint Rose Camerata, Guest Starring Elvis!!! 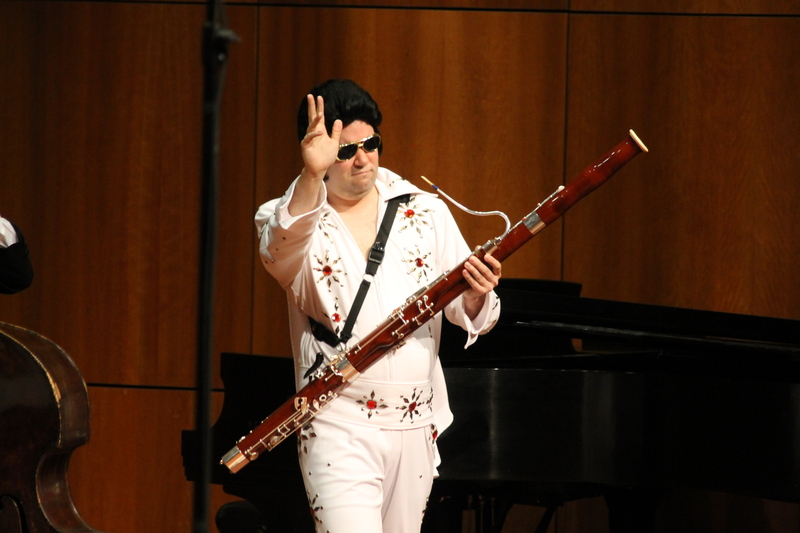 Yes, you read that title right – Elvis guest starred in the 10th Anniversary performance AND season finale of the Saint Rose Camerata! 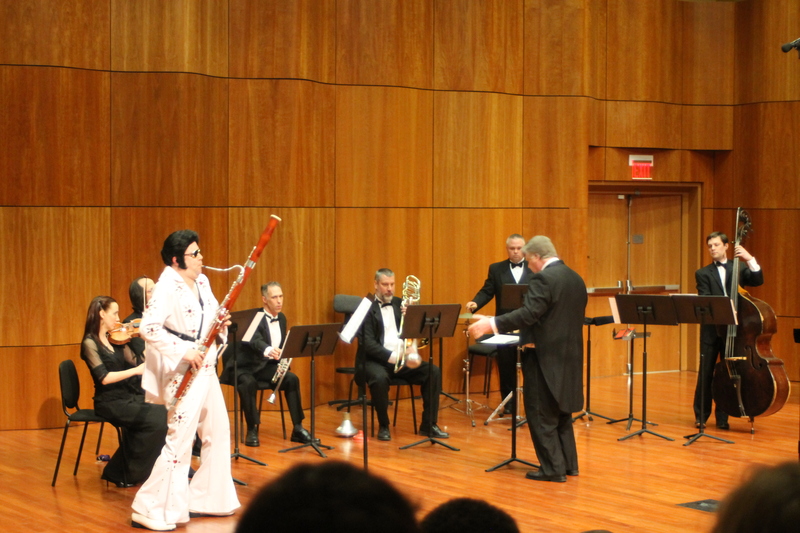 No, Elvis wasn’t really there (that would be pretty impossible), but the Camerata did indeed play a song that included a professor performing while dressed up as Elvis, so it’s a close second. 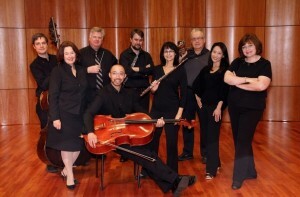 A group picture of the Saint Rose faculty members of the Saint Rose Camerata! Photo taken from Saint Rose Camerata website. Well, on Saturday, April 13th, the Camerata performed their 10th anniversary concert and their season finale for the 2012-2013 season. (And, I have to add, it was standing room only! I struggled so hard to find a seat!) 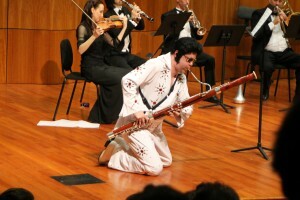 The concert program consisted of the following pieces: Prelude to the Afternoon of a Faun by Debussy (chamber version by Schoenberg) Dead Elvis for solo bassoon and chamber ensemble by Michael Daugherty (Sherwood Wise, bassoon), and Appalachian Spring for 13 instruments by Copland (and yes, the Dead Elvis piece is what Elvis was in!). Dover Beach for baritone and string quartet by Samuel Barber (Woody Bynum, baritione) was also slated to be on the program, but the singer, Mr. Bynum, was under the weather and could not perform (if you want to know how to take care of your voice, check out my blog post about it here!). Needless to say, all of the performances were absolutely incredible. The Debussy piece was very mesmerizing; I could feel myself drifting into the world that Debussy intended to create. Appalachian Spring is a beautiful piece of music (please take the time to listen to it, it’s amazing! ), and hearing it live was an amazing experience. And, of course, who can neglect how great Dr. Sherwood Wise was as Elvis in Dead Elvis??? The piece itself is a unexpected, but with the addition of the “Elvis-isms” provided by Dr. Wise, the piece was a great treat for everyone to enjoy. We all had a good laugh, and we were able to hear some amazing music. Dr. Sherwood Wise performing “Dead Elvis” on the bassoon. Photo credit to Dr. Michael Levi. I think the best part about the Camerata performances is the fact that you get to see why the Saint Rose music faculty is so amazing – not only are they great teachers, but they have the chops to back it up. They’re amazing performers, and are great role models to look up to. I am so grateful to go to such an amazing school filled with not just great talent from the students, but great talent from the faculty. 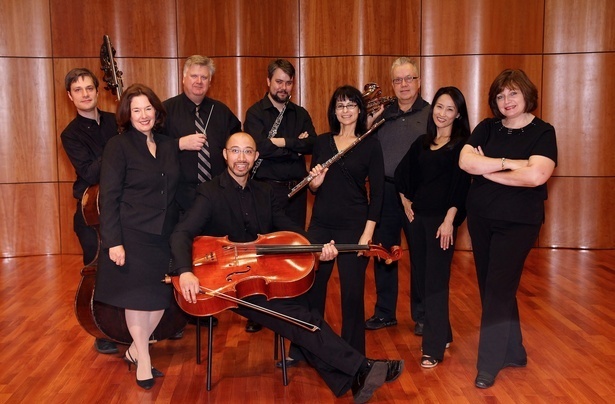 If you want to learn more about the Saint Rose Camerata, please visit their website! While this year’s season has ended, you can always check them out next season! Be on the look-out for the Saint Rose Premiere Performance schedule to see when they perform, along with other amazing artists! ← Pre-Graduation Shock + Transition Theory = Figuring It All Out!